MIAMI, Florida (CNN) -- Father Alberto Cutie, an internationally known Catholic priest who admitted having a romantic affair and breaking his vow of celibacy, was married this week in Miami, Florida. 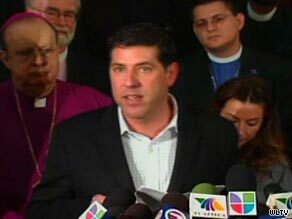 Father Alberto Cutie was married in Coral Gables, Florida, on Tuesday, according to court documents. Cutie, 40, announced last month that he was leaving the Catholic Church and joining the Episcopal Church. A judge performed the marriage ceremony Tuesday in Coral Gables, Florida, for Cutie and Ruhama B. Canellis, 35, according to Miami-Dade County court documents. Cutie, whose name is pronounced koo-tee-AY, is a native of Puerto Rico, and Canellis was born in Guatemala. He was received into the Episcopal Church on May 28 at Trinity Cathedral in Miami. He will pursue the priesthood in the Episcopalian faith, the Episcopal Diocese of Southeast Florida said in a written statement. It was not immediately clear how long the process would take. Cutie -- sometimes called "Father Oprah" because of the advice he's given on Spanish-language media -- shocked some in the Catholic community when photographs of him embracing a bathing-suit-clad woman emerged last month in TV Notas magazine. He acknowledged having carried on a two-year relationship with the woman, who at that time had not been publicly identified. "This is something I've struggled with," he told CNN in May. "I don't support the breaking of the celibacy promise." Referring to his relationship with the woman, he said, "It looked like a frivolous thing on the beach, you know, and that's not what it is. It's something deeper than that." After the photographs surfaced, Cutie was removed from his duties at St. Francis De Sales Catholic Church in Miami Beach and on the Radio Paz and Radio Peace Networks. Cutie had been president and general director of Pax Catholic Communications, home of Radio Paz and Radio Peace. He has also written newspaper advice columns and a self-help book, "Real Life, Real Love." John C. Favalora, archbishop of the Catholic Church's Miami archdiocese, said last month that Cutie's actions have "caused a grave scandal within the Catholic Church." Favalora also had harsh words for the Episcopal Church's decision to accept Cutie. "This truly is a serious setback for ecumenical relations and cooperation between us," he said.